Update v3.5: Windows Phone 8 supported, Bux fix. 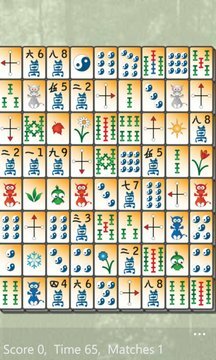 Smart Mahjongg is nearly the best adaptation of a popular old Chinese board game especially for Windows Mobile based Pocket PCs with Touchscreen. Other names are Mah Jong, Taipei, Taipeh or Shanghai. The objective of this tile matching Solitaire version for single player, which is implemented in Smart Mahjongg, is to remove all 144 tiles from the board. This game is an excellent tool to coach the own skill on the touchscreen. With many options the game on the screen size can be adapted. An online high score list allows worldwide comparison with other users. 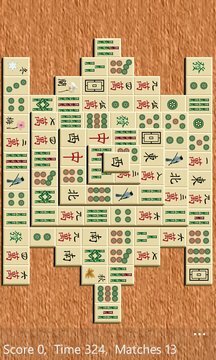 This is the XL version of Smart Mahjongg, with some additional fun: more layouts, more tile sets, and active participation in the high score list. The trial version has no time limit but blocks the updates and high score participation. There is no advertising at all.